The global atmospheric cycle of P is simulated accounting for natural and anthropogenic sources, acid dissolution of dust aerosol and changes in atmospheric acidity. Simulations show that P-containing dust dissolution flux may have increased in the last 150 years but is expected to decrease in the future, and biological particles are important carriers of bioavailable P to the ocean. These insights to the P cycle have important implications for marine ecosystem responses to climate change. This study investigates whether the UAV (drone) based WDI can determine crop water stress from fields with open canopies (land surface consisting of both soil and canopy) and from fields where canopies are starting to senesce. This utility could solve issues that arise when applying the commonly used CWSI stress index. The WDI succeeded in providing accurate, high-resolution estimates of crop water stress at different growth stages of barley. Carbon stabilization should not confound soil microbial activity, which drives biogeochemical cycling and ecosystem services. 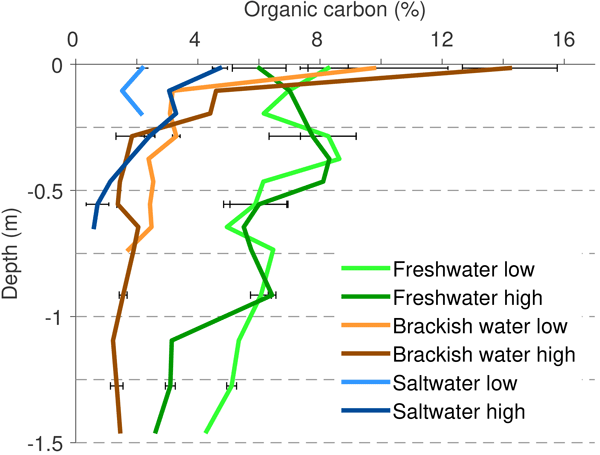 Across a rice soil chronosequence from tidal marsh, organic carbon concentrated both in coarse-sand- and clay-sized aggregates and enhancement of labile carbon supports high-microbial activity in macroaggregates. Thus, carbon physically protected in macroaggregates promotes bioactivity in rice soils, coevolved with prolonged rice paddy management over centuries. The terrestrial environment has been affected by tritium contamination. There is a need to assess the dynamics of organic hydrogen in soils in order to predict the fate of tritium. In the present study we traced carbon and hydrogen from plant-derived molecules and hydrogen from water in different soil types. The main findings of the work are that water is the main donor of organic hydrogen and the long-term fate of hydrogen (and tritium) will depend on the status of soil carbon dynamics. We studied how many measurements are needed to correctly represent the soil respiration flux, mostly to help researchers who do not have automatic chambers to perform these measurements, so they can sample as seldom as possible. Our results show that for our site conditions, at least two measurements should be made in one day, one of which should be made at night-time. We also found that it is more important to make more field campaigns than measuring more times in one day. Increasing CO2 is changing seawater chemistry towards a lower pH, which affects marine organisms. We investigate the response of a brackish plankton community to a CO2 gradient in terms of structure and fatty acid composition. The structure was resilient to CO2 and did not diverge between treatments. FA was influenced by community structure, which was driven by silicate and phosphate. This suggests that CO2 effects are dampened in communities already experiencing high natural pCO2 fluctuation. We used a laboratory experiment to examine how climate change and permafrost melting might alter soils in high-latitude regions. Soils were subjected to two temperatures and drought, and gas emissions were monitored. Carbon dioxide fluxes were influenced by temperature, water, and soil nitrogen, while methane emissions were much smaller and linked only with nitrogen. This suggests that such soils may be very sensitive to changes in moisture as discontinuous permafrost thaws in interior Alaska. Life on Earth is directly or indirectly linked to primary production (PP), the quantification of which poses a challenge. In our study we use the oxygen isotopes and oxygen–argon ratios technique to estimate PP in situ. To date this method has been used to assess PP in the ocean and we expand on its application to freshwater systems. Providing that the physical structure of the water column is constrained, this method presents a powerful tracer for atmospheric vs. photosynthetic oxygen input.